Through the practice of meditation, we glimpse unconditional goodness as the ground of our existence. Opening to this original nature with gentleness and appreciation, we begin to see our potential as genuine, dignified, caring human beings. 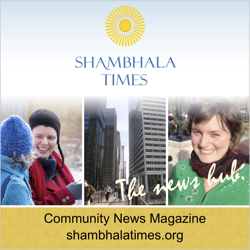 Shambhala Training programs include meditation instruction, periods of meditation practice, one-on-one meetings to clarify questions, talks by senior teachers, group discussions, and a concluding reception. Within this weekend program, there will be a unique subgroup designed for youth. Teens, share conversation and breaks with your peers! BSC has a partial grant to encourage and support teens in the Front Range area to gain a foundation in mindfulness-awareness meditation practice. If you know of a young person who would be a good fit, please tell them about this cool opportunity! This program is deeply discounted for folks 18 and under. No one will be turned away. Donations gratefully accepted. Please call Nicole Wolf at 917 570 9234 if you are coming from out of town—accommodations may be available Friday and Saturday nights in Boulder. This program is open to everyone. There are no prerequisites. The Friday night talk is free and open to the public. Shambhala Training is a sequence of programs for anyone interested in exploring meditation as a way to develop openness gentleness, fearlessness, and confidence toward ourselves and our world. Each training presents a progression of Shambhala warriorship—a path of nonaggression born from the willingness to meet our world without bias or judgment. This path shows how to take the challenges of everyday life as opportunities to increase our capacity for kindness and compassion. The Way of Shambhala includes Shambhala Training programs I–V, with each training followed by a five-week "In Everyday Life" course that expands upon what was offered in the training. Over the course of a year, these programs introduce the entire Shambhala path. This series offers a glimpse of the Shambhala vision of enlightened society by emphasizing how meditation can impact our daily lives—and from there, how the sanity of meditation can impact our community and our whole society. If these pricing options are unworkable for you, we are happy to accept what you can offer, including volunteer service. Please contact Danny Goldsmith at [email protected] or call 303.444.0190 x104 at least three days in advance.